WeChat. The new way to connect. Join our quicklygrowing global community of over 200 million users. WeChat is the complete mobile communication and private social networking app. Free, crossplatform, and fullfeatured, WeChat is the best way to keep Touch with everyone you care about. Free crossplatform individual and group messaging with text, voice notes, images, Video , Location data, and more. Secure, locally stored message histories always accessible offline. Private, groupbased photosharing social network. Incredibly easy friend adding by shaking your phones together, scanning QR codes, syncing with your phone contacts, sharing IDs, or using locationbased services. Blazingly fast registration with your phone number. 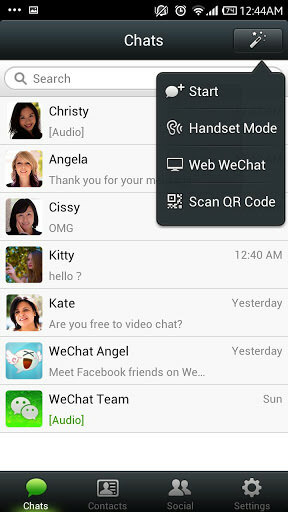 Web WeChat: chat on WeChat from your PC through the browser. See http:web.wechatapp.com for details. Support for 18 languages including English, Chinese, Thai, Vietnamese, Indonesian, and Portuguese. API allowing thirdparty apps to share their content through chats or to Moments. See http:developers.wechatapp.com for details.